Determining the user experience is challenging since the experience is based on many factors. The performance of an application is one of the factors that determine the user experience. If the performance of an application is bad, the user will grade the experience as bad. 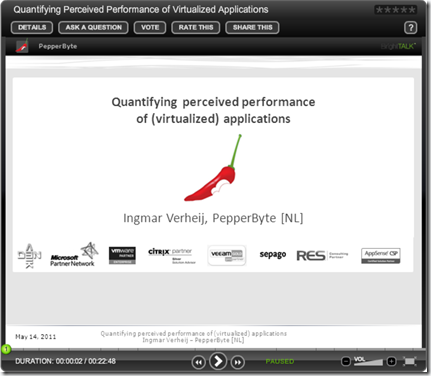 The performance of an application can be influenced by many components. Delivering the application to a user usually involves a rather complex chain consisting of many links. For instance a (virtual) desktop system that has to compete for resources, a WAN connection that experiences delay and jitter or a backend infrastructure that has to deliver content. Reduced services in any component has the same effect for the end user – their perception of the quality of the performance is reduced. The user doesn’t want to know what the cause is (although it helps to understand and maybe accept) they only perceive a decrease in performance. Quantifying and grading the performance of an application as perceived by a user is challenging and requires guidelines and thresholds. I’ve done research about the psychological effect of (variable) response times on the user experience and existing methods of grading performance. In this document I will explain a process to quantify and rate the perceived performance of an application based on the response time of an application. For this purpose two new indexes are introduced: Application Responsiveness Index (ARI) and Perceived Performance Index (PPI). The image in this blog is from renjith krishnan and can be found on freedigitalphotos.net..